When it comes to deciding where to use digital signage, there is really no wrong answer. Many diverse industries are embracing this innovative, affordable, and highly effective technology. Retail, health care, hospitality, nonprofit, education, technology, and corporate entities are all discovering that digital signage can be used in an impressive array of ways to draw attention, facilitate communication, improve perceptions, and make sales. 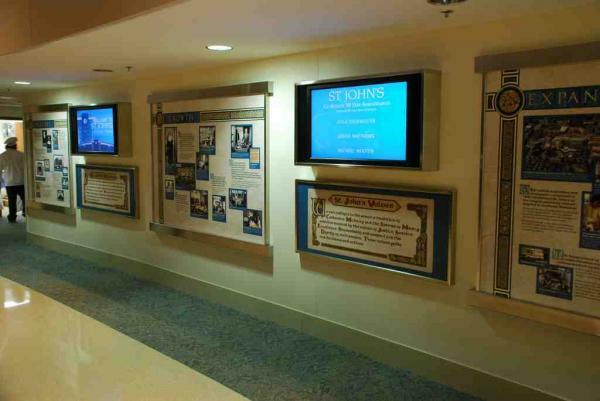 Digital signage is a fantastic way to grab attention for a wide variety of purposes. Whether placed outside your business or event to lure the public inside or utilized inside your space to interact and engage with people, digital signage is a surprisingly easy way to get across the messages that matter to organizations and audiences. Your audience might include the general public, potential customers, established clients, or even employees. Digital signage catches the eye in a way that static displays do not, so it is only natural that the idea of placing this type of signage outside your business or event should top the list of where to use digital signage. According to ScreenCloud, some 80 percent of customers say that they’ve entered a store because digital signage caught their attention. Placing a digital sign in a display window or near the entrance of your space can attract attention, reinforce your branding, share a message about your company, or advertise your products or services. It is a valuable opportunity to start a conversation with potential customers before they even set foot in your establishment. As signage. Of course digital signs can be used as standard signage. Provide directions to pertinent locations, promote your products and services, highlight specials and sales, and provide the answers to frequently asked questions. As menu boards. Digital signs are easily updated, so using one as a menu board ensures that your customers always have the latest information on what you can offer them. Special promotions and changes in offerings or pricing can be quickly incorporated, reducing the possibility of confusion or frustration. As entertainment centers. Whether in a bar, a mechanic’s waiting room, or a waiting room in a health care facility, it is incredibly common to find television screens droning on in spaces where people wait. Why not use this as an opportunity to entertain your audience in a way that benefits your business? Instead of simply turning on a television, use digital signage to play custom content that is tailored to your field or show your own video segments that showcase your company’s philosophy, history, products, and services. Alternately, you can establish your company’s authority by providing informational programming or highlighting your employees’ accomplishments. You can also strengthen your relationship with established customers by promoting them with short stories that demonstrate how your services support their success. As a source of revenue. Everywhere you turn these days, there are ads. Customers today expect to see advertisements and commercials cross their screens, so the prospect of seeing an ad or three is not significantly off-putting, especially if it is for a relevant product or service. Would you like to offset some of your costs by generating advertising revenue? If you can demonstrate that your digital signage generates sufficient interest, you may be able to sell spots to other businesses in your area or companies that offer related goods or services. As a way to connect with the community. Networking is a fact of professional life, and many people concerned about the environment advocate buying local as a means of reducing your carbon footprint. Why not use your digital signage as a tool for demonstrating your connection with the community that your company serves? This can be accomplished by putting notices of upcoming community events in between the ads for your products. You can also use your digital signage to highlight local volunteer opportunities, celebrate local achievements, or discuss the ways that your business supports the local community. When you’re ready to put your business or event in the spotlight with digital signage, count on the experts at Southwest Audio-Visual. Our team has the insight, experience, and understanding to help you plan, design, and integrate an effective digital signage system that delivers the features and flexibility that you need to produce the impression that you want. Contact us today to learn more about where to use digital signage and to explore the possibilities this technology offers your business.